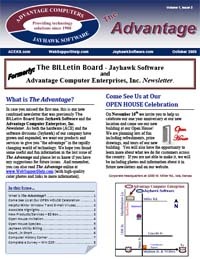 “The Advantage” is our new combined Newsletter that was previously The BILLetin Board from Jayhawk Software and the Advantage Computer Enterprises, Inc. Newsletter. We are combining our newsletters and making it available to all our customers since so many of our products and services now overlap. 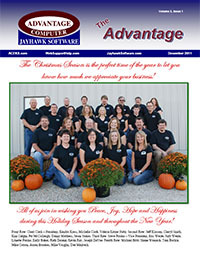 As both the hardware (ACE) and the software (Jayhawk) divisions of our company have grown and expanded, more and more of our products and services from both divisions help customers that previously worked with only one division. The Past…Present…and Future – Thanks to You! The Present…Our “Team” Wishes You Peace, Joy, and Hope! Jayhawk Users’ Software Training. It’s J.U.S.T. what you need! 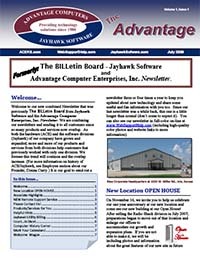 – Jayhawk Users’ Software Training. It’s J.U.S.T. what you need! Complete a Survey – Win $25!